In celebration of Black History Month, the Friday Center proudly presents a free theatrical performance presented by dramatic artist Mike Wiley on Sunday, February 14 at 3:00 pm. 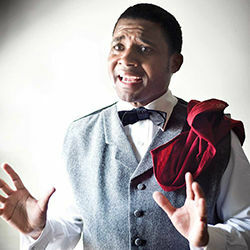 His one-man play, One Noble Journey, tells the story of Henry “Box” Brown, an African American born into slavery, who overcomes seemingly insurmountable odds to gain a life of freedom. After the death of his first master, Henry’s family was torn apart and parceled out to various beneficiaries of the estate. Eventually Henry married and had children, only to have his wife and children sold to a new owner and never seen again. This devastating incident was Brown’s breaking point. He devised an ingenious escape plan—sealing himself in a wooden box for shipment to friends and freedom in Philadelphia. Although he was not subjected to physical violence, Henry’s story, as the basis of the play, demonstrates that the cruelty of slavery was just as devastating to the heart as it could be to the body. One Noble Journey offers a powerful lesson of freedom, faith, and the triumph of the human spirit. Admission is free, open to the public, and appropriate for all ages. Advance registration is requested: call 866-441-3683 or email fridaycenter@unc.edu.